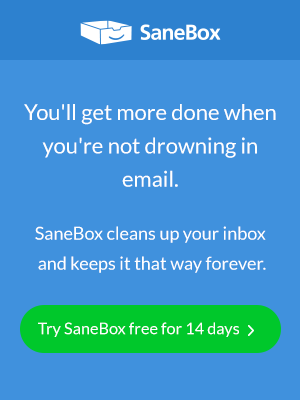 The biggest challenge for those using SaneBox is “letting go” of the unimportant stuff and concentrating on their INBOX. To help with this, we send an “unread, unimportant email digest” which allows everyone to quickly scan the cruft to make sure there isn’t a nugget of gold there. Now you can have this digest whenever you want it! You can “Add” as many scheduled digest times as you would like. You can remove all of the current scheduled digest times, but don’t because you should check your @SaneLater folder regularly. Remember to make sure we have the correct time zone for your location so these times are correct.